The Cannonball Blaster is a fast paced, fun-filled, game suitable for all members of the family. 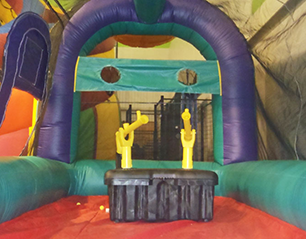 Hand-eye coordination and reflexes are tested as teams scramble for soft, foam balls, launch them through the tandem cannons, and into the nets, (or towards their opponents) on the opposite side of the inflatable “Battle Dome”. An unforgettable experience, with guaranteed laughs for all. Up to 4 people can participate in this activity at once.